I love cards with a lot of white space. Some people who really inspire me to use more white space are Silke, Charmaine, and Rose Ann. Love their stuff! I sometimes make cards with white space, but I rarely *layer* white over white over white like this.....and I wanted to give it a try. I think it really shows off this beautiful basket image. This is a new set from Flourishes. It's called Signs of Spring and you can get it at Stamper's Dream. The sketch is today's OCC challenge from Laurie Schmidlin. I love Laurie's work! 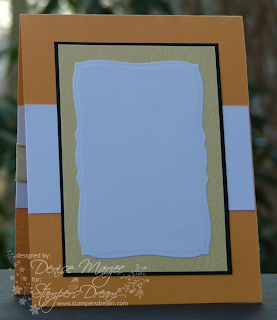 Just this week, she made a card with a lot of white space for the Stamper's Dream Monthly Challenge. That's where I got the inspiration to use the Swiss Dots folder on the base layer....and in white. You can see her card HERE. Very pretty, huh?! The main image is up on Dimensionals and so is the scallop oval behind it. The lacey panel with the Happy Easter sentiment is also up on Dimensionals. Here's the inside of the card. 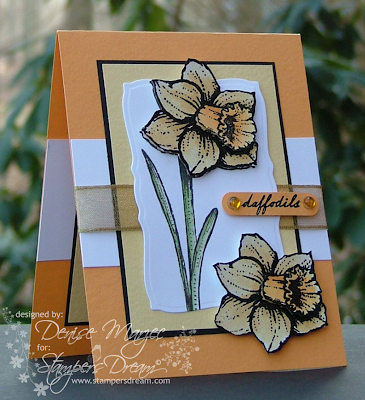 The reason I stamped the daffodil on a separate white panel is to keep the Copic coloring from showing through the back of the card. The panel is also up on Dimensionals. Here are a couple cards I made using Wednesday's SCS Sketch (SC217). I used my Posies For You cling-set, one of the awesome Anna Wight cling sets from Whipper Snapper Designs, and paired it with a couple sentiments from the SASI Year of Sweet Sentiments set. On the first one, I used Parisian Breeze DP and colors. The Kraft mats behind the posies are up on Dimensionals. Angel Wings Shimmerz was added to the posies and leaves. ...and a close-up of the Shimmerz....I love Shimmerz! Are you enjoying all the sneak peeks this week from There She Goes? We have one more set to show you. This one is called Nature of Friendship. The sentiment, branch, bird, and stem silhouettes in the background are all part of the new set. The curved rectangle Nestabilities panel and both circles are up on Dimensionals. For this month's "bling it out" challenge theme I added some Taylor's Tiny Twinkles under the bird and sentiment. This awesome layout is Amy Rysavy's sketch from February 20th (AMYRS59). I love this one and I'm sure I'll be using it again! 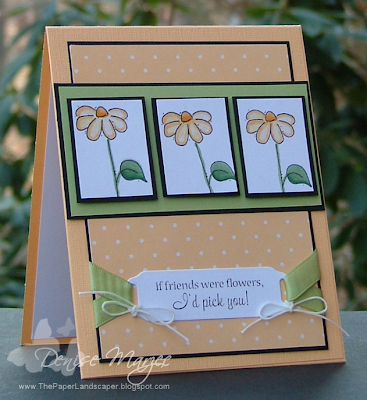 On the inside of the card, I stamped more of the stem silhouettes as well as a butterfly that's also part of this new Nature of Friendship set. Lots of fun pieces in this one! ~ Blog Hop Challenge: Hop around to all the DT members' blogs, leave a comment on each sneak peek post, then go to Jessica's blog and enter your name in the Mr. Linky box for a chance to win the TSG stamp set previewed that day. You have until 12 a.m. Saturday to enter. ~ The TSG Release Party will be held Saturday night from 7 to 9 p.m. Pacific time on Paper Craft Planet in the TSG forum. 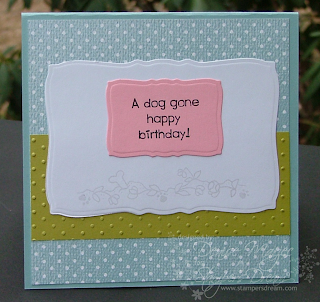 Winners of the Card Challenge and Blog Hop Challenge will be announced at that time. Hi everyone! It's time for the Stamper's Dream monthly challenge! This month Tosh is challenging us to make monochromatic cards. You're all welcome to play along! 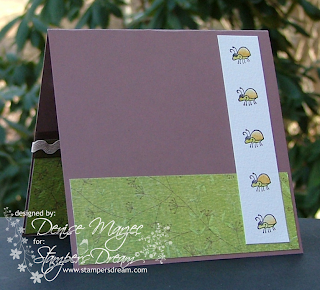 Just make a monochromatic card (using stamps that are available at Stamper's Dream of course) and post a link to your project on Michelle's blog....she's going to have a PRIZE for one lucky participant! If you upload to SCS, use SDDC5 in the keywords. It's a 4.75" square card....and man oh man, did I struggle with this challenge. Why did I struggle with it?...because I was determined to use this pretty Flowers & Friendship set by Impression Obsession but I was stumped on what to do on the leaves since green would be against the "monochromatic" rules. I finally decided to color in the leaves (and swirls) with my Sakura glitter pen. How's that? Legal right? Hope so! The main image square and the dark Rose mat panel behind it are both up on separate layers of Dimensionals. The Rose (Medium and Dark) Prism paper is also available at Michelle's store. Here are links so you can see cards from the rest of the Stamper's Dream DT: Michelle, Tosh, Charmaine, Cindy, Kim, and Laurie. 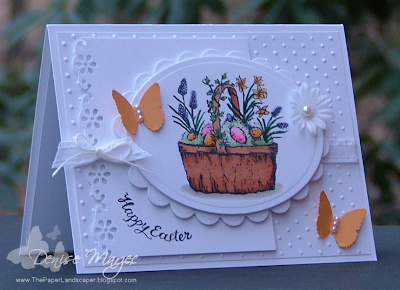 My TSG sneak peek card is in the post below this one...just scroll down a bit to see it. I'm back with another TSG sneak peek! Today we're showing you the new set called Slow & Steady. Don't forget this month's TSG challenge is to make a card/project and "bling it out" by adding something shiny, glittery, shimmery, or sparkly. For my card today, I added some gold metallic string as well as Golden Wheat Shimmerz paint to the dragonfly and on the snail's shell. The double ended tag with the sentiment is up on Dimensionals. The piercing that I did on the front of the card goes all the way through to the inside layer. Want to see more Slow & Steady sneak peeks? ?....Here are links to the individual DT members' blogs: Angela, Becky, Bev, Christi, Faith, Holly, Jessica, Jessie, Joanne, Jodi, Julie, Maki, Silke, Stephanie, and Wendy! Hi everyone! Are you ready to see some sneak peeks from There She Goes? Jessica is releasing three new sets and one mini sentiment set this week! 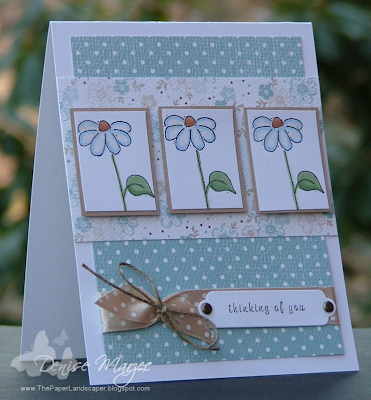 Today we're showing you the new set called Blessings....My VERY favorite! I just love, love, LOVE this Celtic cross and the Irish Blessings quote!! I stamped the cross in the background in River Rock on Very Vanilla CS, and then stamped the quote over it in Memento Cocoa. That Vanilla circle as well as the Chocolate Chip scallop circle behind it are both up on Dimensionals. I added some gold shimmery PTI ribbon to my card because this month's TSG challenge is to "Bling it out" by adding sparkle, rhinestones, shimmer, glitter, etc...anything shiny. 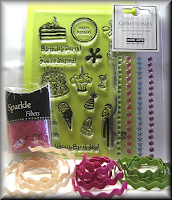 If you make a "blingy" project and upload it by 12:00 a.m. this Saturday, you'll be entered to win a free TSG stamp set from Jessica. Winners will be announced on Saturday night at the Release Party, which will be held on the Paper Craft Planet forum from 7 to 9 p.m. Pacific time. Now be sure to check out all the gorgeous sneak peeks from the rest of the TSG team. Here are links to their individual blogs: Angela, Becky, Bev, Christi, Faith, Holly, Jessica, Jessie, Joanne, Jodi, Julie, Maki, Silke, Stephanie, and Wendy. There's another challenge for you this month, called the Blog Hop Challenge. Over the next three days, you'll have a chance to win the stamp set featured each day. All you have to do is hop around to all the blogs of the DT, leave a comment on EACH sneak peek post, then go back to Jessica's blog and enter your name in the Mr. Linky box. You have until 12 a.m. Saturday to enter. 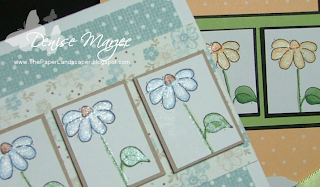 I'll be back tomorrow with another TSG sneak peek as well as a card for the monthly Stamper's Dream Challenge. Hi everyone! Today Jessica is announcing her newest Design Team members. Check it out on her blog! Lots of serious talent coming on board! Starting tomorrow and continuing through Friday, we'll be showing you sneak peeks of three new TSG sets plus one mini sentiment set. This will be my last release with There She Goes. Jessica is bringing on some fresh faces and my six months as a DT member will be done at the end of March. Even though I won't be on the DT, I'll still be using her stamps though! They really are great quality stamps! Now....remember on Sunday you were asked to submit a question to the TSG design team? Well, here are the favorite questions. My answers are below and here are links to some more TSG team members so you can see their answers: Jessica, Jessie, Maki, Joanne, Becky, Christi, Bev, Wendy, Angela, Julie, Jodi, Holly and Stephanie. 1. What do you typically start a project with? What's picked first: stamps, embellishments, DP, colors? It totally depends on what I'm working on. If it's sneak peeks or a sketch challenge, then I pick my stamps first and pull the CS colors/DP to go with the image. If it's a color challenge, then I'll pull a stamp based on what would go with the colors. 2. Do you give away your cards, sell them, send them or hoard them? I mostly send mine to friends and family. Some I hoard for a while though. I haven't gotten into selling them...I'm always afraid that selling them will make it feel like a *job* and I don't want my card making to become a job. 3. If you could design your own stamp or stamp set, what would it be? Something with cute little animals/characters, maybe something beachy...definitely images that could be colored. 4. Where do you get your inspiration? I'm definitely inspired by my oldest daughter (the true artist) and fellow stampers. The SCS galleries are a GREAT source of inspiration! Challenges are a great place to start...especially sketch challenges (in my opinion). Nature is a great source of inspiration too. 5. How do you balance your stamping time with your personal time/work/kids/etc? Typically I stamp in the morning when my youngest is watching cartoons or when she's at preschool, afternoons are usually set aside for running errands (mom's taxi service, grocery store...I feel like I'm always at the grocery store, LOL! ), evenings are when I work or *try* to go to the gym. Sometimes I set up my 4-year-old at the craft table with me...she stamps with her kid stamps and I stamp with mine. 6. What is your favorite embellishment? Shimmerz! 7. What is something that not a lot of people know about you? I don't like to talk on the phone, LOL! 8. On average how long does it take to create one of the cards we see each week? My cards take anywhere from 20 minutes to two hours. 9. What is your favorite coloring medium? I switch back and forth between Copics and watercoloring, but watercoloring is still my favorite. 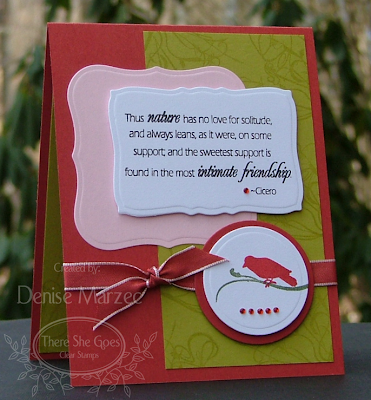 Terri: I definitely prefer to pick the colors of my CS/DP for my card and then color the main image. What do you prefer? Kimberly: Yep, sometimes I sit down to make something and it just does NOT come together. Definitely no fun. In those cases, I just have to walk away and come back later. 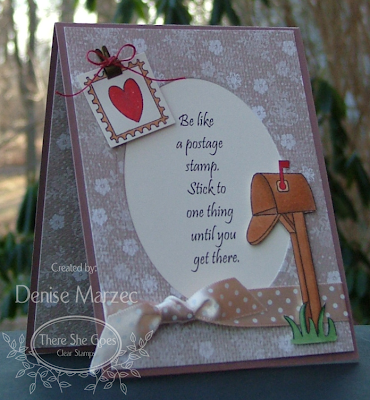 Debbie: I've been stamping for almost two years now...time flies! I don't think I have a signature style. If I do, I'd love to hear what it is, LOL! Ten Hut!! Stampers...drop and give me 10!! Hehe, that was the fun post title from Beth when she picked Jami Bova (sgtstamper) as this week's Featured Stamper on SCS. Love her lead in where she says "taps foot, waits patiently" Too funny, Beth! The BEST part about her write up though was, of course, that Jami was picked this week! Yay, Jami, CONGRATULATIONS, girl!! I chose to CASE this card of Jami's. Pretty! I kept the same layout, window idea, polka dots, and embellishments to the corners. I changed the stamps (to Jami's very own Value of Joy set by 2 Red Bananas), added a dimensional butterfly over the circle window, moved the bow, and my card is a regular A2 size instead of a square card. I added another butterfly to the inside of the card, stamped in black in the lower left-hand corner. You can see it peeking out in the picture above. The first green panel is up on SU dimensionals, the bottom polka dot layer that's against the card base is up on 1/8" foam tape that I got at Taylored Expressions...it's really thick stuff (thicker than SU Dimensionals) so this is a really "puffy" card, ...remember, I like "puffy" cards, LOL! I have two cards for you today using my new stamps from Our Craft Lounge. The layout on the first card is the Sketch Saturday Challenge from February 14th. The OCL Just Bugz stamps, MME Free Bird DP, May Arts sheer brown ribbon, and May Arts champagne ric rac ribbon are all available at Stamper's Dream! The main circle image and the Kiwi mat circle behind it are each up on Dimensionals....so is the punched sentiment and circle behind that. I added Candle Light Shimmerz paint to the wings of the bugs. I added some more DP and bugs to the inside of the card with more Shimmerz to the bugs' shells. Thank you, Silke, for the gems!! The layout on the next card is Taylor's TECC56 Sketch....I just had to move the vertical panel and oval over a little so I could fit the sentiment in the corner like that. The OCL Pat the Bad Dog stamps, MME Penny Lane Free Bird DP, and May Arts teal sheer ribbon are all from Stamper's Dream. The main image and the Chocolate oval behind it are each up on Dimensionals. 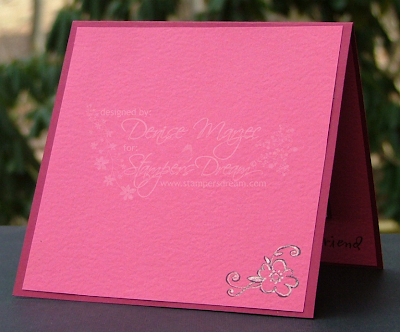 Here's a close-up of the dimension and you can see that I stamped a little on the inside of the card along the bottom. That's it for today! Have a good one and I'll see you this week with LOTS of TSG sneak peeks and the Stamper's Dream Monthly Challenge. "If you could ask the There She Goes design team ONE question, what would it be?" Leave a comment sometime today or tomorrow. I'll pick my favorite question on Sunday night and forward it onto Jessica for something she has in store for us later in the week. Hey all! We're having a BLOG HOP today with the team from There She Goes!.....my very first blog hop! To start at the beginning of the hop, click HERE to go to Jessica's blog. She's first in line and then you can follow the links to everyone's posts today. We're all working with a different stamp set and all the cards are themed around Famous Quotes. I was assigned the Special Delivery set so I did some Google searching and found this quote by Josh Billings. I made the quote on the computer and printed it out on Taylored Expressions Buttercream CS...I know, after I finished the whole card I realized I should have put Josh Billings' name under the quote..oops. Sorry about that! The mailbox and postage stamp are both up on Dimensionals. I added some red shimmerz paint to the red heart and flag on the mailbox. The yummy ribbon is from Jami Bova (thanks, Jami!!!). Here's a picture of the inside of the card. The postage stamp here is also up on Dimensionals. Soooooo, next in line is Holly McMillen! Head on over to her blog to continue the TSG Blog Hop. She'll then link you to the next TSG team member! 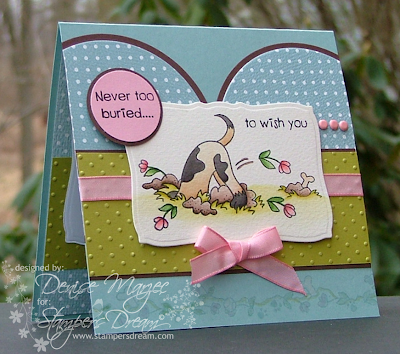 Have you seen OCL's Pat the Bad Dog set?....oh my word, SUCH a cute set! In case you missed my post below, you can now get Our Craft Lounge stamps at Stamper's Dream!! The layout is today's SCS Sketch Challenge (SC216). The main image panel is up on Dimensionals and so is the punched sentiment that says "Never too buried..." Check out the placement of the three pink brads...kinda like a leader line taking you from the "to wish you" sentiment to the inside of the card (well, that's what I was trying to do anyway). The border along the bottom was stamped in Versamark and then I colored in the flowers, leaves, bones, and dirt with Shimmerz paint. I know, the colors on my card are exactly the same as the card I posted yesterday...can't help myself, I love this Parisian Breeze DP and the color combo! Well, I'm gonna go hop in the shower, grab some lunch with my daughter, and then we're off to her first gymnastics class! ...and finally...Tomorrow, February 19th, we're having a BLOG HOP with the team from There She Goes! This will be my very first blog hop too! 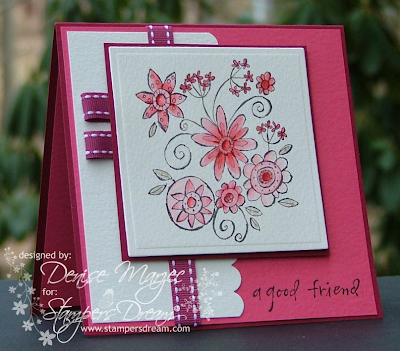 Tomorrow morning at 8 a.m. EST, start at Jessica's blog and you'll be linked to each of the DT member's blogs where you'll see a different TSG stamp set used along the way. Hi everyone! 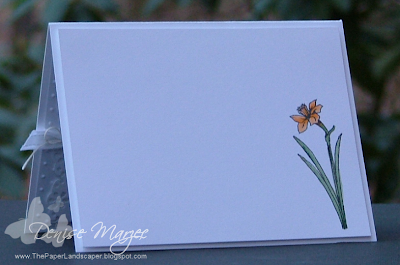 How about a springy card today?....because I don't know about you, but I'm totally ready for winter to be over. 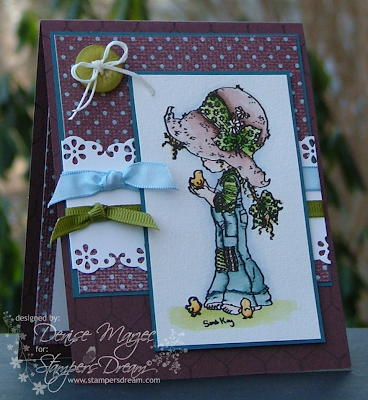 The main image is from Taylor's Year of Sweets 2 set....one of my favorite SASI stamps! Look at the sweet expression on the cupcake's face. So cute! 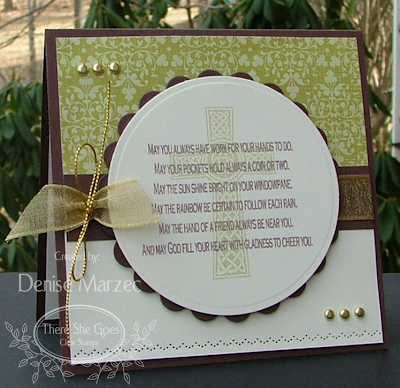 The sentiment is from A Year of Sweet Sentiments....SUCH a versatile set, definitely a must have! The curved mega rectangle nestabilities panel is up on Dimensionals and I added some pink shimmerz paint to the flowers, hearts, the cherry on top of the cuppie, and the butterfly. The green brads also have some sparkle on them. On the inside of the card, I added a panel of the polka dotted Parisian Breeze DP and then layered a white curved mega rectangle nestabilities panel over top...same size as the one on the front. Today I have a card that combines three challenges...the Stampavie Vs. Magnolia Sketch Challenge from 2/10, yesterday's Stampavie Vs. Magnolia Color Challenge (old olive, not quite navy, chocolate chip, bashful blue), and today's Roses on Paper Challenge to make a card with a friendship/love theme. I think this image just screams love and friendship! The Sarah Kay Precious Moments stamp and the JudiKins Chicken Wire Background stamp on the Chocolate base (you might have to look really close to see it) are both available at Stamper's Dream. The navy mat panel behind the main image is up on Dimensionals. That's it for today. I have to get a move on.....I'm headed to the gym this a.m. and then this afternoon I have to pick up my daughter at the airport. She's just getting home from spending a week in Tennessee. Have a good one, everyone! Yaaaaahoooooooo, Daytona!! Are you as excited as I am??!! Just like last week, Dawn and I thought it'd be fun to make some racing-themed cards again to celebrate the 2009 racing season getting underway. 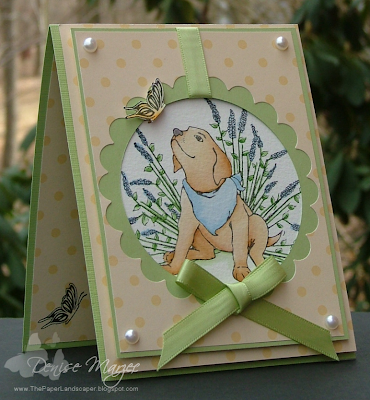 Be sure to stop by Dawn's blog and check out what she made this week...I can't wait to see it! Wanna play along too? We'd love that!! Last week Wendy and Jen joined in with us, and I saw a few of you said you'd love to play along this week. If you do, we're using the same NASCAR1 keyword on SCS uploads. Last week I made a card themed around Kevin's #29 car, so this week I thought I'd make a general racing-themed card. I've wanted to try and make the NASCAR logo for a long time now with my JustRite stamps, so I figured this was as good a time as any to finally give it a try. What do you think? How'd I do with the logo? I pulled my husband's online NASCAR game and matched up the Prism papers to the colors in the logo on the CD. The letters were stamped in white craft onto black CS, heat embossed with white EP, and cut out. I used my 3-1/4" circle stamper, but any of the larger JustRite circle stampers (or the rectangular one) would work. The yellow mat panel behind the NASCAR logo is up on Dimensionals, with the Dimensionals placed around the checkered flag because that already sits pretty high just from the ribbon. The checkered flag was made with the ribbon-weaving technique. I know, I did this last week but I just HAD to do it again. It's such a great way to make a checkered flag!! If you want to see the tutorial, check it out HERE on Rose Ann's blog. Thanks again for the tutorial, Rose Ann! You can get the JustRite products and all the Prism paper colors at Stamper's Dream. Just click on the links in the supply list below. Card Size: 3.5 x 8.25"
Now, LET'S GO RACIN' !!! Gooooooo Kevin !!! 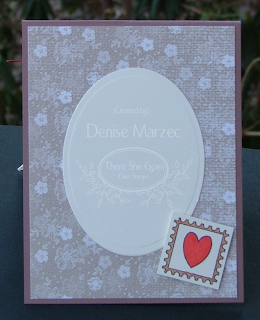 This new set from There She Goes, which is called You're So Punny, is a design concept by the fabulous Holly McMillen. I love this *Shanks A Lot* sentiment...cracks me up every time! We just recently had a little birthday party for our 4-year-old, so I made up a bunch of these to send out as Thank You Notes. 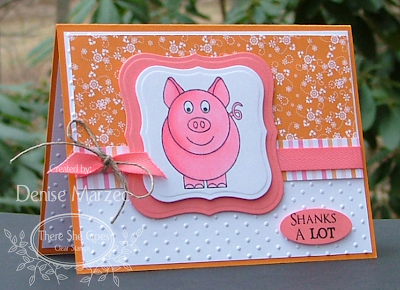 The white piggy panel, Berry Sorbet mat panel behind it, and the punched sentiment are all up on Dimensionals. The layout is Amy Rysavy's Sketch from January 30th (AMYRS56). 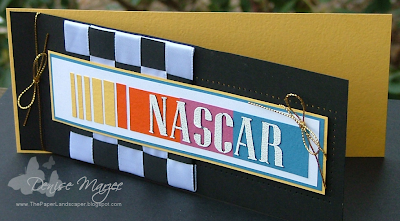 See you all tomorrow with a card for the Daytona 500! Flourishes are now at Stamper's Dream! Hey gang, guess what?! Flourishes is releasing three new stamp sets this week (that are just BEAUTIFUL), and as of 9 p.m. EST tonight, February 13th, you'll be able to get them at Stamper's Dream!! How cool is that?!! Have you seen the sneak peeks over the past couple days from Charmaine, Carolyn, Kim, Tosh, Cindy, and Laurie? Beautiful projects! The set I'm showing today, along with Kim and Amy, is called Signs of Spring. The daffodils on my card were stamped in black craft ink four times, heat embossed with black EP, watercolored, cut out, and layered. There's a close-up pic below showing the dimension. The punched sentiment is also on Dimensionals. The Flourishes stamps, Sunflowers and Papaya Prism papers, Black EP, Neenah White CS, Spellbinders Curved Mega Rectangles, and Adhesive Summer Gems are all available at Stamper's Dream ....but remember, these new Flourishes sets won't show up in the inventory until 9 p.m. tonight. While you're there, you should also check out what's under the New Arrivals button. Michelle has added a BUNCH of great new products recently. Check it out! Well, I made something else to go with it...a cookie jar! You can see it all on the Stamp a Sweet Impression Blog. I'm bananas for Sgt Stamper!